This race starts with boats giving up their handicap time at the start and (in theory) all finishing at the same time. It's a fun way to end the racing season. For race details, refer to the (online/printed) Sailors Handbook. Individual boat start times are listed there. There will be a 80/20 draw after the race ($20/person, with 80% of proceeds going to Able Sail charity and 20% to winner of the draw) and a "bribe bucket". Bribes will allow racers to improve their finish time by paying $5/min. Both types of donation are optional but welcome! There will be prizes for the winners of the modified/fun race. The usual trophy for the real "uncorrected" Chase Race will be presented at Awards Night. This past weekend, the Carruthers series was held. Due to light wind, racing was postponed until after noon but 2 races were eventually held. Thanks to Ross Cameron for pinch hitting as Orange Peel pilot and running the races with the volunteer RC. The weekend of September 9th and 10th was the annual radio controlled IOM Championship regatta held off the breakwater at KYC. It was a beautiful weekend with lots of activity going on around us. We had boats competing from as far afield as New York city, California and Seattle, unfortunately only two boats from KYC. the races were ran in mostly a North East breeze of about 5 to 10 knots which turned out to be a bit of a challenge for the race committee, it certainly kept Tim and Ross busy making sure the course was square and the marks were true to the wind but as usual they were up to the task. we managed to do 33 races over the two days and the scores were very close at the end with the eventual winner being Jerry Brunner from Seattle. KYC put on a very good show and the Americans were very impressed with the air show of which we all had front row seats. 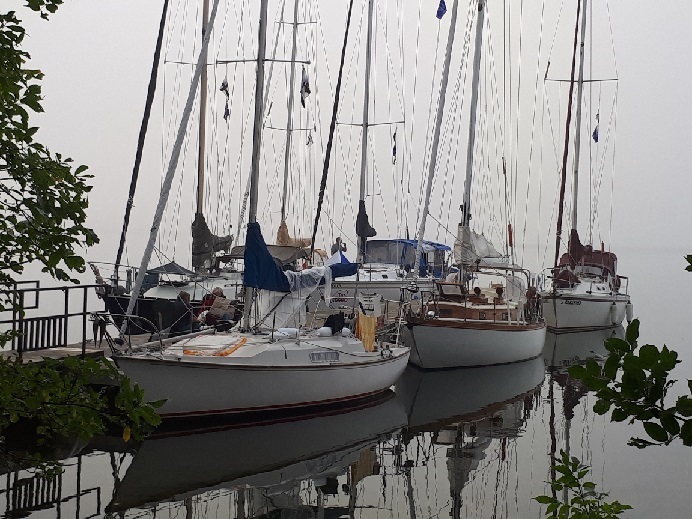 I would like to thank all the volunteers who were Tim Garret ( crash boat ) Mary Wilson ( on site scorer ) Lana Vanrossem who tabulated all the scores from somewhere in cyber space and Ross Cameron who wore one of his many hats for KYC as RD. The KYC staff did an excellent job of providing lunches and libations for the out of towners and all involved mentioned they can't wait to return next year. We will do the best we can to get more local boats involved next year.